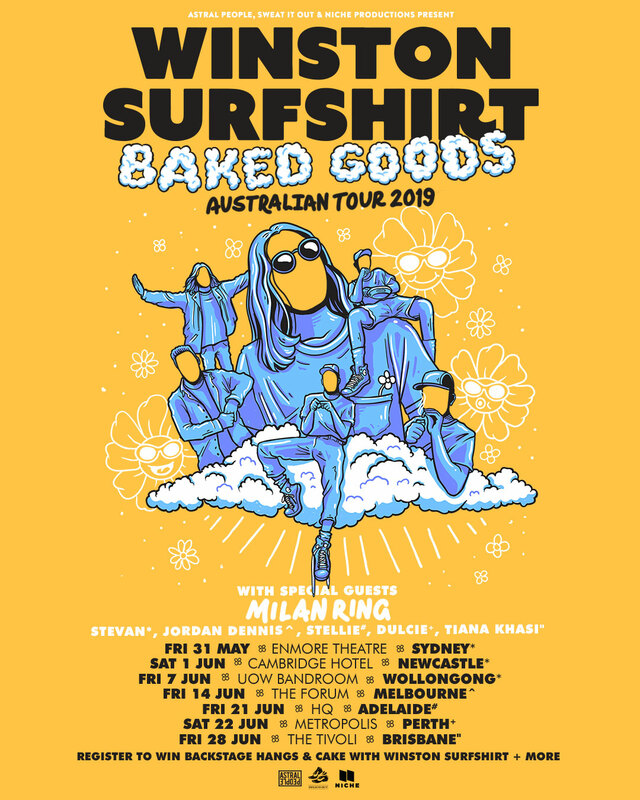 Winston Surfshirt announce their biggest AUS Tour yet! Sydney’s favourite six-piece collective Winston Surfshirt, today announce their biggest national live tour to date - visiting Sydney, Newcastle, Wollongong, Melbourne, Adelaide, Perth and Brisbane from May 31. Supporting on all shows is the surreal sounds of multi-instrumentalist Milan Ring, and in selected cities, Stevan, Jordan Dennis, Stellie, Dulcie and Tiana Khasi. Following the buttery hip-hop toned release of “For The Record” in late 2018, the band now pay homage to their roots: their raucous live shows. Launching at Sydney’s Enmore Theatre on Friday, May 31, the band visit Newcastle’s Cambridge Hotel on Saturday, June 1, followed by Wollongong's UOW Bandroom on Friday, June 7 and Melbourne's The Forum on Friday, June 14. The following week on Friday, June 21, the six-piece land at Adelaide’s HQ before crossing to Perth’s Metropolis on Saturday, June 22. A tour finale occurs on Friday, June 28 at Tivoli in Brisbane’s Fortitude Valley. Further showcasing their unique blend of funk, soul and hip-hop, “For The Record” was Winston Surfshirt’s first new music since their highly applauded 16-track debut record, Sponge Cake. The 2017 LP was a summery debut binding together bold brass and airy vocals, which featured their debut Gold-certified single "Be About You", and received nods from international tastemakers Beats 1 host Zane Lowe and Sir Elton John, Jason Bentley (KCRW), Huw Stephens & Phil Taggart (BBC Radio 1) and Lauren Laverne (BBC Radio 6), alongside earning triple j feature album. Winston Surfshirt have built a cult following off the back of their live shows, with their loved and unique versatility on stage seeing them play to sold-out crowds at home and abroad. They sold out all 10 shows across the country on their Australian Sponge Cake tour, followed by festival billings at Splendour In The Grass, Spilt Milk, Falls Festival, Field Day& This That, before heading overseas and selling out shows across London and Europe. With more new music to follow - don’t delay on witnessing Winston Surfshirt performing their favourites, past, present and future, on their biggest headline tour to date.